The Platform U Step II Walker is a multiple wheeled mobility aid with adjustable forearm supports designed for users who need additional upper body support when walking. The U shaped base is extremely stable and provides support in every direction. 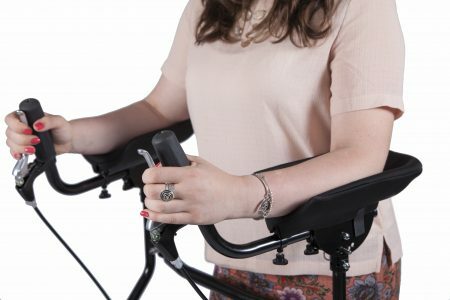 Users with walking or balancing difficulty due to neurological conditions such as Parkinson's Disease, Multiple Sclerosis, Stroke, ALS, MSA and PSP will find this specialized walking aid helpful for increasing mobility independence. 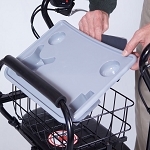 The Platform version of the U Step II Walker is designed for users who need additional upper body support, are unable to use both hands or are unable to stand up straight when walking. This walking aid is often helpful for users with Brain Injuries or Stroke who need additional support when walking. 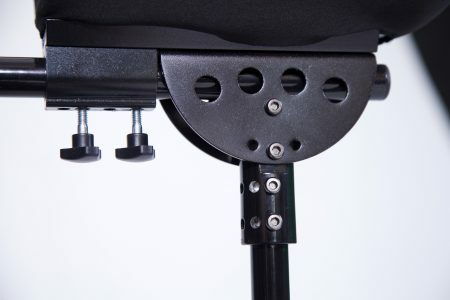 The arm platforms are highly adjustable for various arm positions. Using the Platform U Step II Walker is not like pushing a standard rolling walker. 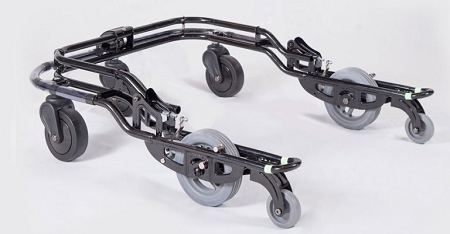 This walker surrounds the user with a unique wheelbase and frame that are extremely stable and provide support in every direction. The U Step Walker II has an innovative braking system that prevents the walker from moving until the user is ready to walk. This feature is particularly helpful when standing up from a chair because the unit will not roll away. The user lightly squeezes either brake release lever to move the walker forward. When the lever is released, the walker stops immediately. The Platform U Step II Walker Medicare code (HCPCS) is E0147. Note: U Step 2 Cueing Module Laser Accessory sold separately. User Height Range: 5 feet 2 inches - 5 feet 11 inches. Handgrips: Up to 38.5 inches high. 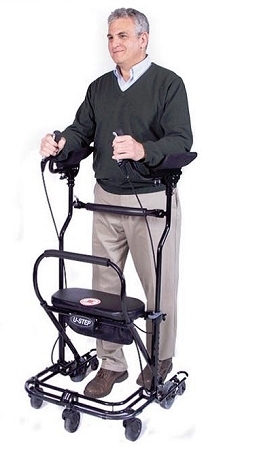 Includes: U-Step2 Walking Stabilizer with forearm platform supports. The platform version takes up more space than the other u-step walkers but the positives out weigh the negative. 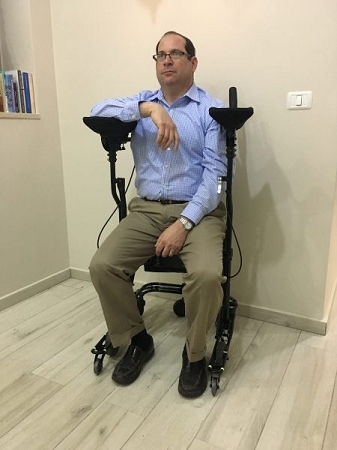 It provides more standing support after having a stroke. Was very excited about getting this. Recovering from a stroke and brain surgeries and have right side weakness. Did not give enough support to stand up straight. Also legs hit the seat/bar when trying to take a step. Physical therapist said that it may be because my weakness is more flaccid than tone. She had another couple who bought one where the wife had a stroke and it didn't work for her but the husband has a spine issue and he was able to use it. Too costly to try to return. Didn't keep all the original packing material. Nice equipment, well put together. Q: Will this break down to fit in a car? A: Yes, the Platform U Step II Walker does fold for easy transport. A: You can ask your insurance company representative if The Platform U Step II Walker is a covered item for reimbursement to you but we do not submit any claims to insurance. Q: How much weight would this walker support. In other words, how much can the person weigh who is using it and still be stable. What is the maximum weight it will hold. A: Weight capacity is 375 lbs. Q: Do you know if the platform u step is cover by medicare? A: It may be, however we do not submit claims to Medicare. You may be able to call your local Medicare representative to see if reimbursement is available for the Platform U Step II Walker. Was this answer helpful? 12 of 17 Customer(s) found this Answer helpful. Q: If I lost balance, can I falling backwards? 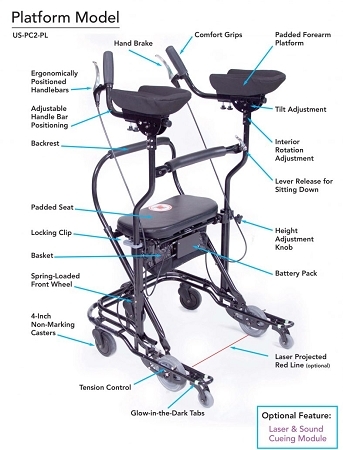 A: The Platform U Step II Walker is designed to surround you for 360 degree support. The back support should keep you from falling backwards in the event you lose your balance. Q: can this upwalker be used on the street? can you board an aeroplane with this device?? A: Yes, the Platform U Step II Walker can be used on sidewalks for the street. Before boarding an airplane you may want to contact the airline company about their particular policies for carry on walkers. Q: If I have a E0147 USTEP II / U-STEP II with Seat & Basket can you buy just the handles? A: Yes, call Customer Service at 877.750.0376 for replacement parts. Q: What is the maximum height from floor to arm rests? Dans height is 6'5" and 305 lbs. he is currently stooping over on a standard roll after. A: User Height Range: 5 feet 2 inches - 6 feet 1 inches. Q: My husband is 6 ft. 3 and this says 6 ft. 1 is the limit? Is 2 inches making that much difference and what is your return policy should it not work for him? A: 2 inches shouldn't make much of a difference, however the cost to return the Platform U Step II Walker could be pricey. Please review our Return Policy located under the Ordering Info: Help + Policies. You may be able to consult with a physician to ensure the height difference wouldn't be an issue before purchasing. A: Please review the Return Policy located in the "Ordering Info: Help + Policies" section. It can be found in the upper right corner of the website.